If you have a young, immature apple tree, you may have noticed some curling and distorting of the leaves. You may have even noticed a lack of growth or stunting of the tree. 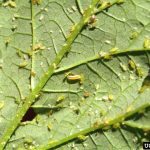 While there can be several causes of these symptoms, apple leaf curling midges are specifically problematic in northeastern and northwestern states. 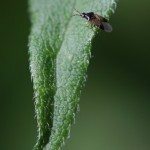 Continue reading to understand the apple leaf curling midge life cycle and how to treat the apple leaf midge damage. The apple leaf curling midge, also known as apple leaf gall and apple leaf midge, is an exotic pest from Europe. The adult is a small black-brown insect with clear wings. The females lay their eggs on the folds of apple leaves. These eggs hatch into little sticky, yellowish maggots. It’s at this larval/maggot phase that the apple leaf curling midge pests cause the most damage. They feed upon the leaf margins and curl them into distorted, tube shapes as they drain the leaves of nutrients. When the leaves turn brown and fall off, the larvae fall to the soil, where they over winter in a pupae phase. While the apple leaf curling midge does not usually cause significant damage to apple crops in older, mature orchards, the pest can cause major damage to nurseries and young orchards. The adult apple leaf midge usually only lays eggs on tender new growth of apple trees. As the larvae eat and distort the leaves, the plant’s terminal shoots are also damaged. This can stunt growth and even kill young apple trees. Learning how to treat apple leaf midge is not a simple question. 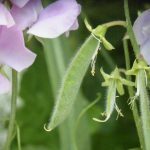 There is no specific insecticide on the market for this pest, and the larvae stay well protected from fruit tree sprays in their leaf curled cocoon. Broad spectrum fruit tree insecticide can help control this pest in its pupae and adult stages, and help reduce the chances of infestation. European orchards have employed the help of biological control agents like parasitic wasps and pirate bugs. If your young apple tree’s leaves are curled and you suspect the apple leaf curling midge is to blame, trim off all infected leaves and branches, and thoroughly dispose of them. A burn pit works well for proper disposal of these pests. For added apple leaf midge control, spray the tree and the ground around it with a fruit tree insecticide. In early spring you can lay out insect barrier fabric around young fruit trees to prevent the adults from hatching out of the soil.